Matthew Rafat's blog willworkforjustice.blogspot.com has a first-hand record of shareholder meetings for a number of companies, though mostly in the Bay Area since that is where he is based. With organizations such as moxyvote starting up and various motions towards more responsive corporate governance, this record is an interesting data point. Large shareholders (pension funds, etc.) are still for the most part slumbering giants. In today's brave new world, people can build and deploy a web app very quickly. However, on the other side of the equation, systems software such as web browsers are not getting any simpler. The cost of the rich media experience in modern web apps quite frequently borne by systems software including browsers, servers, and plugins. Just eyeballing, in Chrome (default multi-process mode), each tab take 30-100 MB of RAM. Luckily, I am not one to keep many tabs open concurrently, but many, many people do. A rich web experience can quickly gobble up whatever amount of memory you can throw at it. There are many people who have compared memory usage for Chrome, Firefox, Safari, and Internet Explorer (TechPP, CNet, Tom's Hardware, DotNetPerls, and many more I am sure), but, here, I would like to take a look at another facet of web browser complexity: source code size, time to build, and size of debug executable. This post follows and expands upon the type of study I did on open source finance software. The economic times have really changed. The scope of household deleveraging is quite astounding. The Federal Reserve releases a figure called the Financial Service Ratio which measures amount of consumer and mortgage debt servicing including automobile lease payments, rental payments on tenant-occupied property, homeowners' insurance, and property tax payments to disposable personal income. For renters, the ratio peaked around 2001 at 31.05. For homeowners, it peak a lot later around 2007 at 17.55. Both have been sliding ever since. This data refers to the country as a whole. The picture for the individual regions may look different. In the Standard ML language, there are two primary mechanisms for refining a module signature after the fact. One is a symmetric mechanism called type sharing and the other called where type, aka fibration. These are useful for facilitating modular programming by enabling reuse of module signatures (i.e., the syntactic "type" of a module). There is a lively discussion on one of the front-page stories on SeekingAlpha about whether buybacks destroy value. As in my previous posts, I am on the fence regarding this one. It really varies on a case to case basis depending on where the money is coming from (some buybacks are highly leveraged and some special dividends come from debt issuance) and where it could have gone instead. It was surprising to see at least one investigation seemingly indicating that Buyback Achievers trump Dividend Achievers by a considerable margin. In terms of the intersection between PKW (PowerShare Buyback Achievers ) and PFM (PowerShares Dividend Achievers), it is only 12 companies: IBM, TGT, WAG, CB, FDO, WMT, GWW, CTAS, TJX, SFG, CASY, LOW. This group outperformed both PKW and PFM over a 1 year time frame. So, anecdotally, a combination of buybacks and dividends coincide with outperformance. Of course, there may be a number of confounding factors that may affect this. Looks like Zynga's IPO day didn't start a social web frenzy (down 7.8% as of now). The broad market certainly was no help here. Quite a pattern is forming with Pandora, Groupon, Linkedin, and Renren. None of these led to an unqualified success, and most of them are doing quite poorly especially if one bought at the open of the first day. Those who bought at the IPO price did considerably better for each of those 3 names. Groupon and Pandora debuted last month and in June respectively. Linkedin and Renren debuted in May. Many of the cloud computing services offer some kind of free tier these days. Most of them are time-limited (e.g., Amazon's free tier lasts for 1 year, Microsoft's 90 days), but some are not including Google. How do they stack up? One recurring issue with the evolution of programming languages is the tension between feature creep and stagnation. Some programming languages manage to evolve very rapidly, incorporating all kinds of features in response to developer requests or the language architect's leading. Brian Goetz has an interesting article on DeveloperWorks which argues for using "corpus analysis", studying the actual frequency of use of language constructs in the corpus of source code, to guide the evolution of a language. In his article, he describes two examples, precise exceptions rethrow semantics and type inference, where corpus analysis played a role in determine how Java evolved. When I was working on SML/NJ, we informally used this technique to determine the best design in terms of certain type checking/inference and module system elements. Taking a sampling of the 41 PKW Buyback Achievers I could find XBRL annual reports on, there are a number of interesting points. The mean buyback rate for 2010 was 7.3% of common stock shares outstanding (DEI). Given this data point, IBM's rate of buyback seems only a middling one. I would caution generalization from a single year's worth of data, but it does provide a little perspective. A particular high or low buyback rate does not mean much by itself. One has to consider where the money for the buybacks is coming from and how is the rest of the business doing. The Fed didn't ride in with the cavalry today. Looking from their perspective, why would they? The domestic data from the past few weeks did not indicate catastrophe. Popular support for further easing is tenuous at best. The main risk is from the debt situation in Europe. The evanescent hope that fueled the past few weeks' action dissipated just as quickly. The Dollar and Treasuries skyrocketed from the lows of the day. In Europe, there is a vicious cycle going on. The large private holders of sovereigns (i.e., banks and funds) insist on being made whole, thus pressuring the very sovereigns they don't want to default. The European governments insist on more and more austerity, negating what little chance they had to have secular growth lift them out of the mess. Following post on Oscigen's benchmark, I was curious how much does increased memory usage due to Ruby and Python-based web app stacks affect the bottom line. Plotting Amazon EC2 instance cost against instance memory shows that costs scale roughly linearly with the memory allowance. The least squares fit is y(x) = 0.028*x + 0.079. Linear scaling means that when Ruby/Rails take 10x the memory (roughly the difference between OCaml/Oscigen and Ruby/Rails) then it costs 10x as much in the long run (and after scaling up). For smaller instances, the difference is probably less. Of course, this doesn't take into account the productivity difference. However, although Ruby and Rails are clearly more productive than C/CGI, it is not clear that it is more productive than other high-level languages with better memory use and performance characteristics. There is a paper from London Business School dated from a while back (2002) that studies simple pairs strategies applied to the whole universe of US treasuries secondary market. The data used are intraday quotes and transaction information from GovPX (thus "high frequency"), which has since been acquired. The paper has an interesting table comparing equity and treasury markets (Table 1). One particular metric is the "social acceptance" of shorting the securities. The claim is that shorting equities has low acceptance whereas shorting treasuries is "less affected". The proposed strategies reduced the standard deviation of returns considerably though the level of returns were also dragged down somewhat. The best performing strategies generally kept risk controls very tight. When transaction and financing costs are accounted for, the returns start to trail the risk free return, though it outperforms equity and the treasury bond index in terms of Sharpe ratio and Gain-Loss ratio. Curiously, these strategies are slightly positively correlated with equities and slightly negatively correlated with the bond index. The GHC Haskell and OCaml compilers do not have builtin popcount support, so again I precomputed the bit pop count for each ASCII letter. Using the same ~9 Mb 4x concatenation of /usr/share/dict/words from last time I measured the performance of the resultant code. This time, the test machine was a Macbook Pro 2.16 GHz with 2 Gb of RAM. The microprocessor is a Core Duo T7400 which has no support for the popcnt instruction anyway. The markets closed on down note. 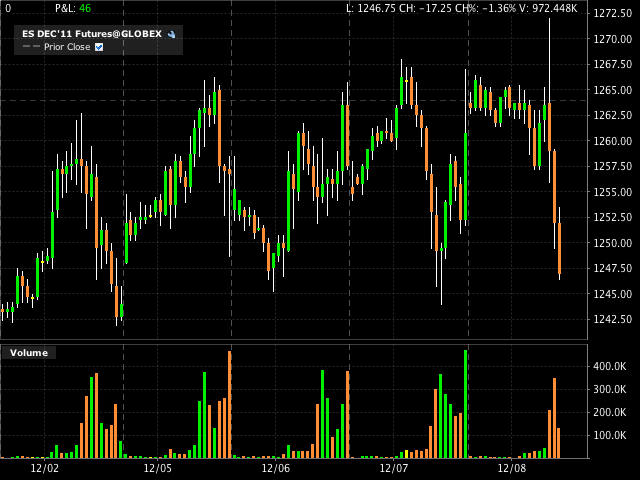 After hours, we have ES, ZN, and DX at 1231.75 (down ~2.5%), 131'055 (up ~0.39%), and 78.920 (up ~0.55%) respectively. Tomorrow is the end of another summit (an EU summit). Europe remains the mover of markets for now. The Dollar is up, 78.780 (+0.310). 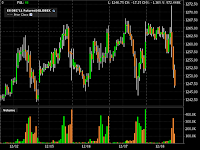 Treasuries are holding quite firm at 130'240. The ECB lowered rates back to the record low to 1.00%, offered banks unlimited cash, but did not initiate new bond purchases. Gold has tripped up a bit, but nothing game-changing at this point. Taking a look at the weekly for large-cap equities (S&P 500 E-mini), one can see the slow but steady upward Europe hope rally (rising channel). Today's action appears to have rejected new highs, but there has been no significant confirmation of a break in this very short-term time frame. Ok, the title was a little tongue-in-cheek. I did a fairly whimsical experiment yesterday. Since text strings are represented as bits which are either 1 (on) or 0 (off), I was wondering which unused domain names used the minimum number of "on" bits. The answer may be non-intuitive to the non-computer scientist. Why is the name of this blog "substructural"? In turns out that in the realm of advanced type systems, there is a family of type systems derived from a family of logical systems called substructural logics. The chief distinction of substructural type systems is that one or more of the "structural properties" of type environments are eliminated. These rules are exchange, weakening, and contraction. Exchange allows arbitrarily reordering bindings in the type environment. Weakening enables adding new bindings. A type derivation is deemed "weakened" in the sense that if a program already typechecks using a certain type environment, adding new bindings to that environment won't negate the well-typing of the program. I read a couple of technology-/startup-oriented articles recently. One was yesterday's Forbes article on developeronomics which describes the growing prominence of talented software developers and investment in them in stark terms. Following my previous discussions of share buybacks here and here, let's look into the distribution of the share counts for the PKW (Share Buyback Achievers ETF) components. The components of the Share Buyback Achievers exhibit significant diversity in outstanding shares. For this study, I used the outstanding share information from Yahoo Finance which appears to be a rough undiluted number. The mean, median, and standard deviation of share count are 242M, 81M, and 430M respectively. The component with the minimum number of shares outstanding in this fund is homebuilder NVR with a mere 4.98M shares out. Mega-retailer WMT has the most with 3.44B shares. The past few days have seen a veritable firestorm of flames between the Java and Scala communities. The proximate cause was a leaked private email outlining what the Yammer folks disliked about Scala. An official post from Yammer followed but not before many bloggers had a field day with the leaked email. What is interesting is that one such discussion on Stephen Colebourne's blog pointed that the the lack of a "module system" is a principal deficiency of Scala. This point, mind you, was not part of the Yammer email. In fact, it preceded the email by a few days. The post cited the Scala's community's response to an inquiry about Scala and "module systems" [Google Groups]. That inquiry initially resulted in some misunderstanding. I tweeted a little while ago about a post from the Untyped people on applying a multiarmed bandit algorithm to website optimization (in contrast to A/B testing). It turns out that many have considered the multiarmed bandit problem for optimizing market maker profitability, Bandit Market Maker by Penna and Reid [PDF]. The basic idea is to dynamically optimize (i.e., reinforcement/online learning) the use of k-levers each operating under initially unknown and eventually partly known distributions. Presumably, the more one uses the levers, the more one learns about the reward, but there is an exploration-exploitation dilemma -- since we are operating online one has to choose whether to take the empirically revealed best choice thus far or to continue to explore for more rewarding options. The exploration-exploitation dilemma also matters to genetic algorithms and programming, but the multiarmed bandit problem explicitly optimizes for it. The exciting thing is that after decades of research, they have found optimal algorithms for the multiarmed bandit problem. The Untyped post cites one of them, Finite-time Analysis of the Multiarmed Bandit Problem by Auer et al [PDF]. One would logically expect oil stocks to track with crude oil prices. For the most part, this is true. Below are the correlation coefficients between a select number of oil services, drillers, refiners, integrated conglomerates, an oil sector ETF (XLE), and an ETF for accessing crude prices (USO), imperfect as it may be due to futures roll. Though most companies track with USO, there are a couple of exceptions. Transocean (RIG) exhibits low correlation with other sector companies and even a negative correlation coefficient with the commodity itself. Halliburton (HAL) has also been exhibiting very low correlation coefficient (0.16).